When We Were Alone is one of those books that brought forth a lot of emotion as I read it. There were sighs of sadness for what Native people experienced at boarding schools, and sighs of--I don't know, love, maybe--for our perseverance through it all. 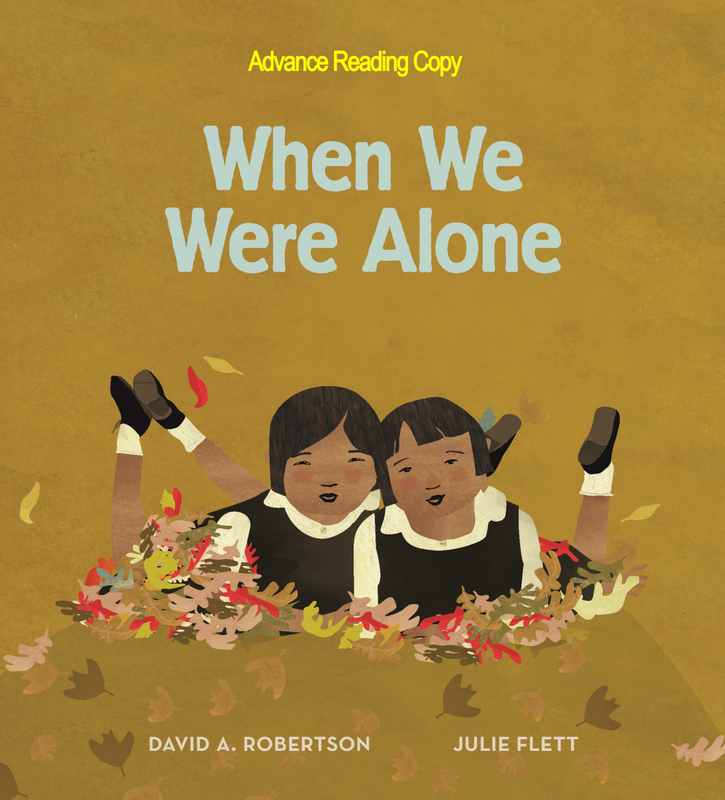 Written by David Alexander Robertson and illustrated by Julie Flett, When We Were Alone will be released in January of 2017 from Highwater Press. I read the ARC and can't wait to hold the final copy of this story, of a young children asking her grandmother a series of questions, in my hands. The story is meant for young children, though of course, readers of any age can--and should--read it. Today I helped my kókom in her flower garden. She always wears colourful clothes. It's like she dresses in rainbows. When she bent down to prune some of the flowers, I couldn't even see her because she blended in with them. She was like a chameleon. "Nókom, why do you wear so many colours?" I asked. There's a page about why she wears her hair so long, now, and why she speaks Cree, now. And, a page about being with family. Each one evokes the same thing. Tenderness. And a quiet joy at the power of the human spirit, to survive and persevere in the face of horrific treatment--in this case--by the Canadian government. 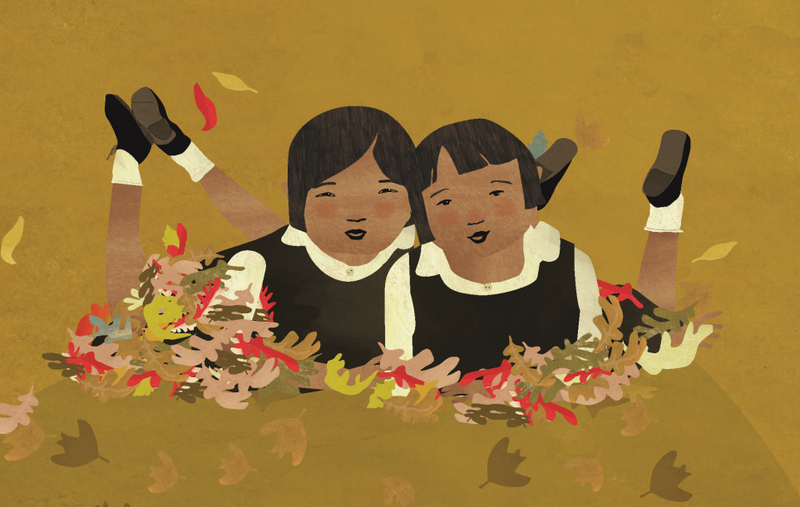 Stories of life at residential or boarding school are ones that Native people in the US and Canada tell each other. In Canada, because of the Truth and Reconciliation project, there's an effort to get these stories into print. I'm glad of that. 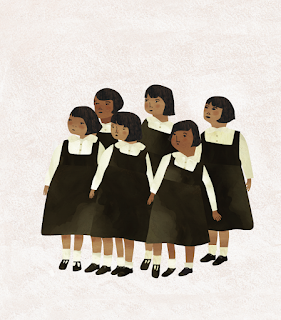 We haven't seen anything like the Truth and Reconciliation project in the U.S., but teachers and libraries need not wait for something similar to start putting these books into schools, and into lesson plans. When We Were Alone is rare. It is exquisite and stunning, for the power conveyed by the words Robertson wrote, and for the illustrations that Flett created. I highly recommend it. Back to provide links to the author and illustrator's websites. Both are Native. People have been asking me about James Preller's The Courage Test. I got a copy of it, and it was in line for a "Debbie--have you seen" post. On September 20, 2016, a conversation on Facebook prompted me to move it up in the line. Will's dad, Bruce, is a history professor. He's into Lewis and Clark so much, that he named his son William Meriwether Miller (William for William Clark, and Meriwether for Meriwether Lewis). Bruce's reverence for the expedition is evident as I read The Courage Test. As they travel, Bruce tells Will about the expedition, how Lewis and Clark were seeing a "new world" (p. 22) and "things that had never before been seen by white men" (p. 27). He gives Will a copy of O'Dell and Hall's Thunder Rolling in the Mountains to read. If it is anything like what I read in Island of the Blue Dolphins, it is a poor choice if Bruce's intent is for Will to learn about the Nez Perce people. When Thomas Jefferson was president, a lot of North America was unexplored. No white American had ever seen huge parts of it. I owe the greatest debt to Undaunted Courage by Stephen E. Ambrose, The Journals of Lewis Clark edited by Bernard DeVoto, Lewis and Clark Through Indian Eyes: Nine Indian Writers on the Legacy of the Expedition by Alvin M. Josephy Jr., Lewis and Clark Among the Indians by James P. Ronda, and Traveling the Lewis and Clark Trail by Julie Fanselow. Exaggeration of the importance of the expedition of Lewis and Clark is a typical American response to mythology. We have traditionally been taught to believe that the Lewis and Clark expedition was the first penetration of white men into the western lands. This belief is totally unfounded. The location of the Mandan villages, scattered from the present North Dakota-South Dakota line along the Missouri River to some distance above present-day Bismarck, were already common knowledge. French and British traders had already established a thriving commerce with these villages and the sedentary Indians were accustomed to dealing with foreigners. Did Preller choose to ignore that? Or... did Will (writing in his journal) think that the French and British didn't count as "White Americans"? It just doesn't seem to me that Preller actually brought any of the writings in Josephy's book to bear on what he wrote in The Courage Test. Listing Josephy's book, then, feels... not right. "My people, the Nez Perce, crossed this river not far from here in 1877. They hoped the Crow would join them in their fight against the U.S. Army, but the Crow turned their backs." Remember, Will, this was a military operation. They were headed into hostile territory. Bruce says "hostile territory" with his Nez Perce friend, sitting right there, beside him. Don't his words, then, seem.... odd? Let me frame it this way, for clarity. Let's say I'm camping on my homelands. One of my dear friends and her kid are there, too. We're sharing a drink and talking about colonization. That dear friend would not say to her kid "Remember, ___, this was a military operation. They were headed into hostile territory." She might do it out of the blue in a cafe in a city somewhere, but if we were having a drink around a campfire ON MY HOMELAND and talking about something like the Lewis and Clark expedition... that friend wouldn't do that! And if she did, I'd say something. So---why didn't Ollie say something?! He fusses with his front forelock, stylishly sweeping it up and to the back. "Going for a different look today?" I joked. Ollie frowns. "It is the style of my people. Goes back generations. Don't you like it?" "I definitely do," I say. I said above that I stuck with this book. That hair style part was tough. So is the part where Ollie tells Will that the bear he thinks he saw the night before was not a real bear (Will didn't see any tracks)... it was probably a spirit animal. They, Ollie tells Will, occur when someone is on a vision quest. It comes, he says, to "bestow the animal's power" and is a "great gift" that he must accept (p. 81). Later in the story, Will has an encounter with a bear. He froze, unable to do what he planned to do if he came across a bear (he's prepped for it), and thinks he's a failure. So.... I guess the power of the "spirit animal" didn't work... in that moment. Will's major task in this book is to be ready for dealing with his mother's cancer. Maybe that's what he'll need the power of that "spirit animal" for, but, really. This is all a mess. So is how the dreamcatcher is shown, later. So is the "illegal" they meet and help out. I've got more notes, but I think what I've shared here is enough. Published in 2016 by Feiwel and Friends--an imprint of MacMillan--I do not recommend James Preller's The Courage Test.